SPARTA, IL. (July 25, 2018) – Zanders Sporting Goods, a national distributor located in Sparta, Illinois, continues to grow by hiring new employees. 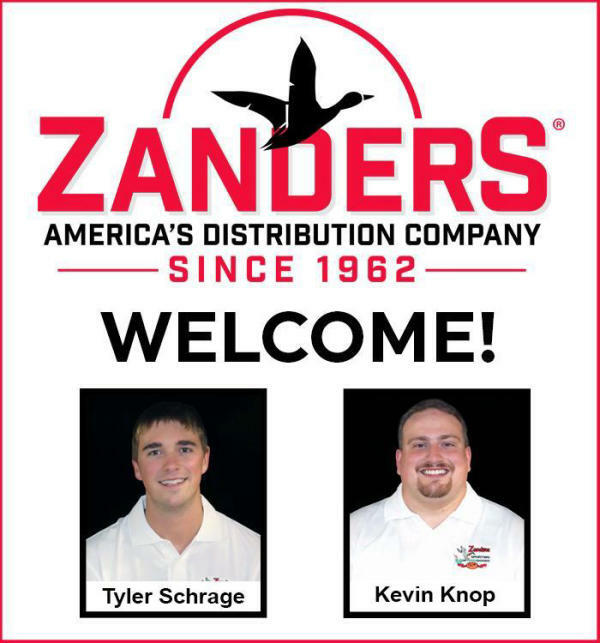 Kevin Knop and Tyler Schrage are the latest additions to the expert sales staff at Zanders. In his free time, Kevin enjoys hiking, baseball, and spending time on the lake. Tyler Schrage is another great addition to the Zanders’ sales team. Tyler, an avid outdoorsman, hunter, and shooting enthusiast, previously worked in the construction field and received his bachelor degree in business administration from Illinois State University. “What I like most about working at Zanders are the relationships I build with customers and the family-oriented work atmosphere,” Tyler commented. Kevin, Tyler, and the rest of the knowledgeable sales team at Zanders are always available to help customers and answer any questions they may have. If you’re interested in working for Zanders, visit their website at www.gzanders.com to view their full listing of career opportunities.